Making the Cleo pinafore or dungaree dress? Vanessa here today – let’s talk about choosing your size and fitting the dress. The relaxed, loose-fitting design of dungaree dresses makes Cleo easy to fit - yay! This style of dress doesn't have any darts or close-fitting seam lines that need to mould to your curves, and it hangs straight down, so don't worry about trying to get it to fit a sway back. Don’t hold the tape measure too tight around your body - you want to be able to fit a little finger between you and the tape. Circle your measurements in the Body Measurements chart in the instructions. If your measurement falls in between a size (for example, if it's 27in rather than 26in or 28in) it’s nearly always better to choose the larger size, as it’s easier to take the dress in if it’s too big than to let it out if it’s too small. 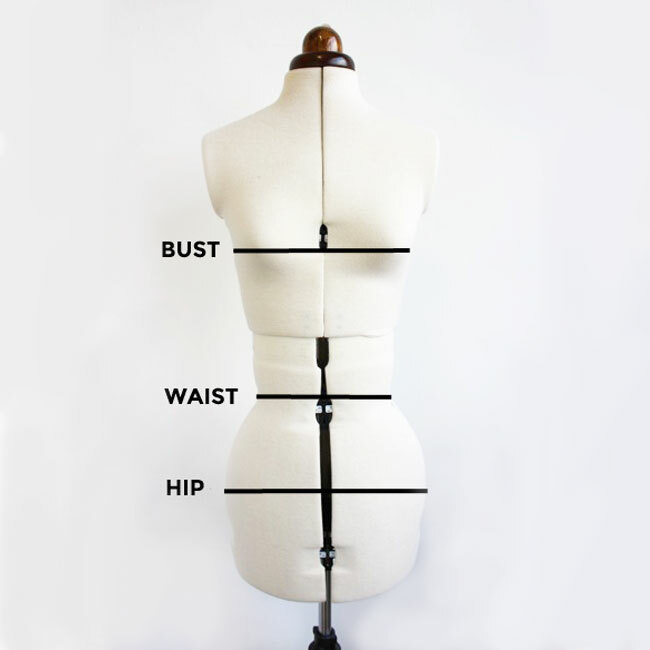 If your waist and hip measurements all fall into one pattern size – fantastic! That’s your size! There’s a key on the pattern sheets that shows a particular style of solid or dashed line for your size – that’s the one to use when you cut your fabric. If your proportions don’t match one pattern size – for example, if your waist is a size 4 and your hips are a size 6 – you can mix and match sizes to make a dress that is tailored especially to you. Begin by re-drawing the side seam on the front dress and back dress so it gradually tapers from one size to another. The red line in the photo above shows a side seam that tapers from a size 6 at the waist to a size 4 at the hips. The green line shows a side seam adjusted for a size 4 waist and size 6 hips. You can do this by either sketching the line out with a gentle curve, or using a curved ruler. You'll also need to adjust the facings to match - sketch the angle of the new side seam on each facing side seam. You can choose between two hemlines when making Cleo - mini or knee-length. The finished lengths of each are listed on the Finished Measurements chart in the instructions, measured from your nape (the nobbly bit at the back of your neck). If you are particularly tall or petite you may want to adjust the length of the dress. As the side seams are mostly straight, adjusting the length is easy to do. To lengthen the dress, tape an extra piece of paper below the hem line, and add an extra rectangle to the depth you want to lengthen it by. Do the same for the front dress and back dress. To shorten the dress, you can wait until you sew the hem - try it on and take up the hem by however much you like. Easy peasy! Before you sew the side seams together, it's a good idea to pin them first, 15mm (5/8in) from the edge, and try the dress on. You can take the seams in a bit at the waist if you want to, but do remember that this dress has no zip, so don't make it close-fitting - you'll need to be able to slide it on and off! If you do take the side seams in at the waist, you'll need to take the facings in at the side seams by the same amount. The instructions will tell you at which point to try the dress on and check the length of the straps. Ideally you should position them so the top of the skirt is sitting at your natural waistline - but feel free to adjust them to what looks right to you, some people prefer a higher or lower front panel on a dungaree dress :) Also check how the dress feels both standing up and sitting down. If you're making the pinafore version, once you're happy with the length of the straps, mark where you want your buttons to sit. If you're sewing the dungaree version, pin the straps in place around the buckles. Another thing you may want to check at the sewing stage is the position of your pockets. Pin them in place and try the dress on before stitching them down - we've included placement markings on the pattern, but you may prefer them to sit slightly higher or lower. And that’s it! Woohoo! I hope you find fitting Cleo nice and straightforward. If you do have any questions, you can ask me in the comments section below. Do share a picture of what you're making on Instagram, tagging us @TillyButtons with the hashtag #SewingCleo so we don't miss it. Can't wait to see your Cleo dress! Cleo Sewing Party - You're Invited! Introducing the Cleo Sewing Pattern!